Straddling two states, the Basque Country today has approximately 3,000,000 inhabitants including 262.000 on the French side (Northern Basque Country). The Basque language "euskara" is a link between all Basques, although it does not enjoy the same status on both sides of the Pyrenees. In the Southern Basque Country (Spanish side), it has been co-official with Castilian since 1979 in the Basque Autonomous Region and since 1982 in part of Navarre. In the Northern Basque Country, at present it is not officially recognised. A Basque Language Commission is currently being set up. 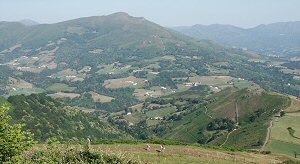 French side or Northern Basque Country: Labourd (Lapurdi), Lower Navarre (Baxe Nafarroa) and Soule (Xiberoa) are part of the Pyrénées Atlantiques département (which it shares with the Béarn region). Spanish side or Southern Basque Country: Biscay (Bizkaia), Guipúzcoa (Gipuzkoa) and Álava (Araba) make up the Basque Autonomous Region whose administrative capital is Vitoria-Gasteiz. Navarre is an autonomous region in its own right whose administrative capital is Pamplona-Iruñea. The Basque Country is located in the south-west of Europe, lying between rivers Aturri to the north and the Ebro to the south. It can be divided into two great watersheds: the Atlantic and the Mediterranean. The mountain chains of the Pyrenees, Aralar, Aizkorri and Gorbeia form a dividing line between the two. The personality of the Basque Country today is fruit of its past history down the centuries. The first known inhabitants of the Basque Country date from the Lower Palaeolithic, approximately 200,000 years ago. Basque (Euskara) is one of the oldest languages in Western Europe, preceding the Indo-European tongues. Various scholars claim that there exist nexus between Basque and Iberian, Berber or some of the languages found around the Caucasus, but the origins of Euskara remain a mystery.